Based on the Canon MP 980 All-In-One (AIO) printer I recently reviewed, I've raised my expectations for these devices. Where they were once something I'd only recommend if someone were short on space and budget, these newer devices are coming into their own as a quality option for printing and scanning. With that in mind, I took a look at the latest offering from HP, the Photosmart Premium Fax All-in-One. With the Photosmart name, I expect to see high quality output. Did the Fax All-in-One deliver? The HP Photosmart Premium Fax All-in-One is a combination Printer/Scanner/Fax/Copy device. Unlike many devices in this category, the Fax All-in-One uses individual ink tanks and offers photo quality printing on glossy and luster surface papers. The printer has built-in duplex, or double sided printing, and includes wireless, USB, and Ethernet in the standard configuration. The HPFax All-in-One goes a step further and also includes Bluetooth as a standard feature, which makes for some interesting possibilities that I'll cover a bit later. 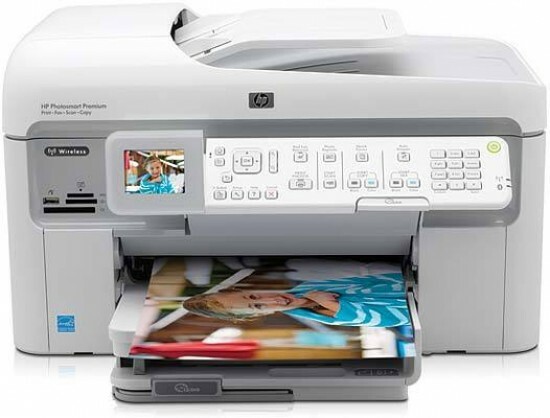 You can use the HP Photosmart Premium Fax All-in-One without a computer if you like. The color LCD gives you access to all features, and a very well laid out control panel (Figure 1) makes it easy to select which options you want. For printing photos directly, you'll work directly from a memory card using the built-in card reader that supports SD, CF, Memory Stick, and xD cards. You can also connect a PICTBidge compatible device via the provided port. 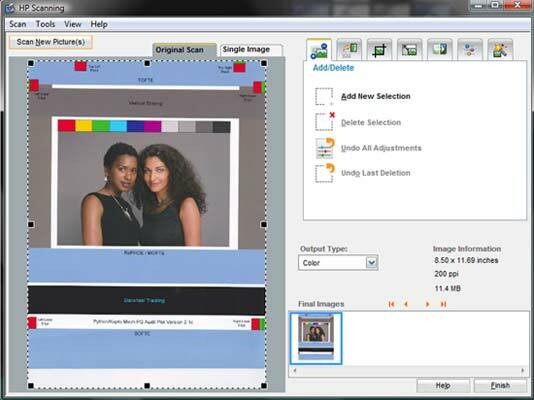 To get started, simply pop the memory card into the slot and print your JPEG images with onboard image adjustments like red-eye correction, and color enhancement. You can also print contact sheets, passport photos, convert to black and white or sepia, and add borders to your prints. The HP Photosmart Premium Fax All-in-One was a little problematic to setup wirelessly on my network. I had compatibility issues with the firewall I use (McAfee) that wouldn't allow the printer to be seen until the firewall was disabled. I ended up using the Windows Vista firewall for my tests. Once this was done, setup proceeded without further issues. I had no problems at all with setting up on a Mac system. The HP Photosmart Premium Fax All-in-One uses a five ink system - pigment black for text, cyan, magenta, yellow, and photo black for photo printing. The inks are HP's Vivera and available in two sizes. The XL size gives you about 2.5 times the prints at less than twice the cost, making it a much more effective way to print. Printing from all machines worked fine using the wireless connection. Scanning was less convenient since you do need to go to the device to load the film or image to be scanned, but once loaded, scanning over wireless worked flawlessly. One of the driving factors in this type of device is the ability to handle the odd scanning job that you might have. Both devices can turn out a quick scan of photos or documents, and work as a photocopy machine with multiple copies. If you're interested in scanning negatives or transparencies only, you can stop reading right now - the HP Photosmart Premium Fax All-in-One only supports reflective scans. The hardware resolution of 4800x9600 at 48-bits will handle most any task you want to throw at it. 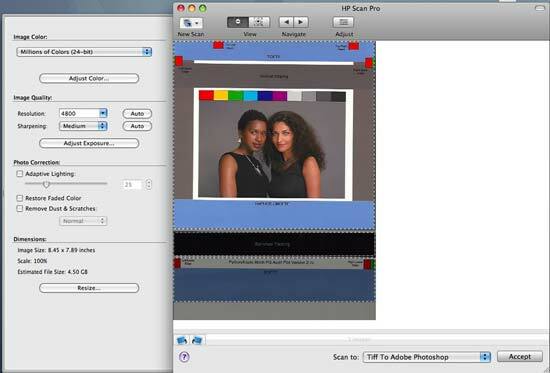 HP includes their Photosmart Studio software. HP Scan Pro (Figure 2) is not as sophisticated as the Canon application, but there is a TWAIN driver that is installed for Photoshop Elements (the driver did not install for CS4) that is more full featured (Figure 3).